A pair of unusual and attractive oak astragal glazed doors, suitable for internal use. 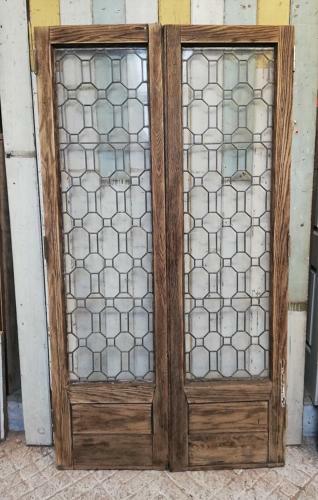 The doors are Elizabethan in style and have small hexagonal glass panels making up the large central panels. The doors are very well made and have attractive mouldings around the glass on the internal face. There are decorative panels at the base. The oak is stripped to bare wood and has a lovely colour and grain. The inner edges are rebated to bring the doors together nicely when shut. The doors have three existing hinges on each outside edge and the internal face of the doors have brass latches. The doors are solid, heavy and well made but do have some signs of wear and age as expected of reclaimed items. There are some knocks and slight damage to some edges and the joints have some slight shrinkage, making the doors more suitable for internal use. There are a few minor breaks to the glass, please see pictures for details. There are some marks and scratches present and a notch at the top of one door and some slight damage where there was a wood knot. The door heights are very slightly different and a small amount of levelling may be needed. The doors are of a very unusual design, perfect for adding style and character to a home. Ideally suited to indoor use, the doors would make a fantastic statement within a period home. Width of pair 107cm approx.